A difficult period of fixtures for Guiseley Vixens has once again seen them suffer a heavy defeat. Their trip to second-placed Sunderland resulted in a third-successive loss, this time 4-1. Sophie Walton scored late on to at least give the Vixens something to cheer and there was a slight improvement in the second half after having trailed 3-0 at the break. They will hope to replicate their previously strong FAWPL Division One form after their last three games saw 13 goals shipped in addition to the losses. Also on a difficult run are Leeds United, who also lost 4-1 in the FAWPL Divison One North despite taking the lead against Chorley early on through Emma Lee. Meanwhile, Brighouse Town turned in a solid performance against runaway leaders Burnley, holding the visitors to a 0-0 draw to make it five clean sheets in seven games. There was certainly no shortage of goals in the West Riding leagues, however, with Premier Division leaders Hepworth United remaining unbeaten after seeing off Brighouse Athletic 3-1 through Abigail Iggleden (2) and Merita Prebrezova. Yorkshire Amateur are still in the title hunt, thrashing Silsden after an improved second-half performance as Leonie Hughes, Gemma Sayer, Nadine Bates, Michelle Walsh and Tanya Fozzard netted for Ammers with Ellie Field scoring for Silsden. Elsewhere, Bradford Park Avenue beat Brayton Belles 5-2 through Natalie Bell, Kirsty Russell (2), Millie West and a debuting Shauna Messenger, while a rare double-header saw Tingley Athletic beat Middleton Athletic 2-0 and 4-0 on the same day. 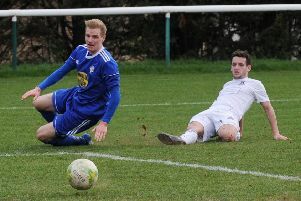 The First Division saw Lower Hopton hammer Dewsbury Rangers 8-0 to stay second, while third-placed Thackley overcame Jess Ogden’s brace to beat Skipton Town 4-2. Leeds City, meanwhile, remain bottom with just two games to go after a 2-0 loss at Ilkley Town. 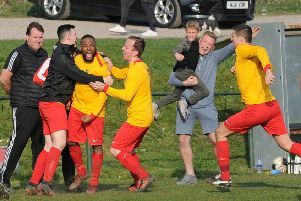 The Second Division title was officially sealed for dominant Farsley Celtic Juniors, keeping their winning run going with a 6-0 thrashing of Pontefract Sport and Social. Scorers were Cam Clarke (3), Kim Clydesdale, Shauna Hill and Keeley Totti. In the Supplementary Cup, Leeds United Development cruised to a 5-0 win over Wetherby Athletic with goals from Megan Smith (3), Jessica Endley and Molly Bridson. Durkar Devils replicated that score against Garforth Rangers and Phoenix edged Huddersfield Amateur 1-0. Elsewhere, Jodie Clarkson, Charlotte Gough and Rachel Barber were among the scorers as Ossett United Reserves overcame Farsley Celtic Juniors Reserves 4-1.